Nigel Timothy Godrich (born 28 February 1971) is an English record producer, recording engineer and musician. He is known for his work with the English rock band Radiohead, having produced all their studio releases since OK Computer (1997). 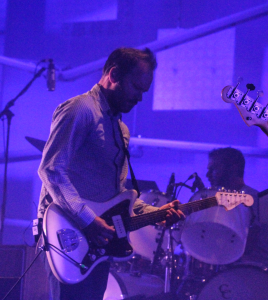 Godrich has produced all of the solo material by Radiohead singer Thom Yorke and is a member of the bands Atoms for Peace (with Yorke) and Ultraísta. Other acts Godrich has worked with include Beck, Paul McCartney, U2, R.E.M. and Roger Waters. He is the creator of the music webseries From the Basement. Nigel Godrich was born in Westminster, London, the son of Victor Godrich, a BBC sound supervisor, and Brenda Godrich. He was educated at William Ellis School in North London, where he shared classes with his friend and future Zero 7 member Henry Binns. Godrich began playing guitar, inspired by Jimi Hendrix and Frank Zappa. He became interested in sound engineering and studied at the School of Audio Engineering. After graduating, Godrich became a junior staff member at the Audio One studio complex, working primarily as a tea boy. After the closure of Audio One, Godrich became the house engineer at Rak Studios, where he became a tape operator for producer John Leckie, with whom he worked on albums by Ride and Denim. In 1995, Godrich left Rak to work with Binns on electronic dance music at their collective Shabang studio. Within six months he began working with mainstream acts including McAlmont & Butler and Radiohead.